Object meets criteria specified on Provenance Research page. Please see Covered Object Fact Sheet. In the seventeenth century, the newly independent nation of the Netherlands created a far-flung network of trading posts and settlements, from Nieuw Amsterdam (now New York) to Brazil, western Africa, India, and Indonesia. One of the most carefully documented of these colonies was the short-lived expedition to Brazil from 1637 to 1644, when the Dutch, under the leadership of Prince Maurits of Nassau, attempted to establish a thriving sugar industry, as well as a capital city. Prince Johan Maurits brought with him a group of artists, map makers, and scientists to record this new world. 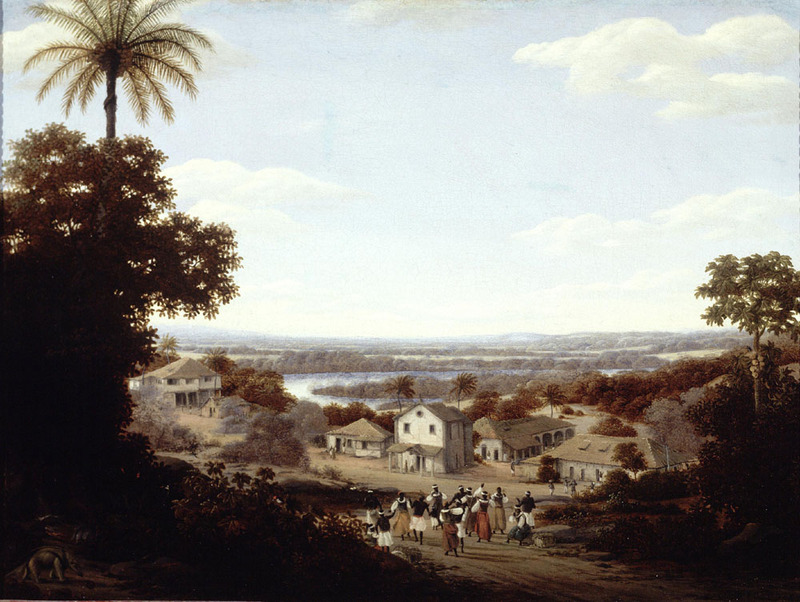 Frans Post, the artist who executed this painting, went to Brazil and saw these exotic landscapes firsthand; this work, like most of his paintings, was executed after he returned to his native Haarlem. His simple, almost naive organization of the recession into the background, ending in distant blue, and the generalized stick figures are typical of him. He often added armadillos, tapirs, anteaters, and other such exotic animals (see the lower left corner of this painting), as a kind of “signature;” he even would include an armadillo, for example, in a traditional subject from the Old Testament. This particular view of the various buildings and slaves of a sugar plantation was probably not meant to document a specific place but rather to suggest a typical establishment of this kind.